Try not to use a barren carcass for the stock. The soup tastes best made with a carcass that has a good amount of meat clinging to it. 1. Bring turkey carcass, onion, carrot, celery, garlic, wine, bay leaf, and 4½ quarts water to boil in 12-quart stockpot over medium-high heat, skimming fat or foam that rises to surface. Reduce heat to low and simmer, uncovered, 2 hours, continuing to skim surface as necessary. Add parsley and thyme; continue to simmer until stock is rich and flavorful, about 2 hours longer, continuing to skim surface as necessary. 2. 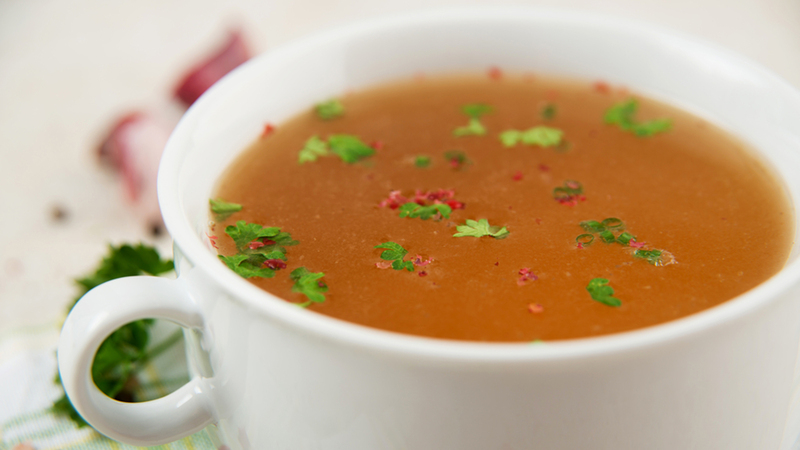 Strain stock through large-mesh strainer into large bowl or container; remove meat from strained solids, shred into bite-sized pieces, and set aside; discard solids in strainer. Cool stock slightly about 20 minutes; spoon fat from surface. Cool to room temperature, cover, refrigerate up to 2 days.